Professional sale and repair of fine string instruments. No matter what condition your instrument is in, you will feel better knowing that we will give it the highest level of care. Years of experience in all areas of string repair coupled with the designing and making of violins and cellos means you can trust us to make the best recommendations for your instrument. My passion for beautiful sound and form guides my hands in their work and I promise that when the work is done you will feel better about playing your instrument. We use only the finest Mongolian stallion tail hair for rehairing. Factory bridges seldom fit correctly and have very little ring tone. We use only high quality bridge blanks and carve them to fit your instrument precisely to enhance tone and beauty. The soundpost gives the instrument its soul and is pressure fit between the top and back plates of the instrument. The post is cut from a fine spruce blank and then properly shaped and placed for the desired tonal response. Fingerboards of the violin family are typically over-scooped, warped, and in poor alignment with the body of the instrument. Correcting the fingerboard can maximize volume, help the intonation, increase projection, and facilitate speed and ease of play. A cracked top or loose seam creates undesirable and harsh buzzing sounds. It takes skill to fix a plate crack correctly to minimize the cosmetic and structural damage. 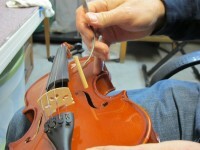 A frustrating part of playing any violin, cello, or viola is a slipping tuning peg. 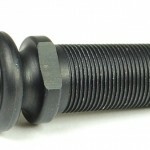 We can adjust and reshape yours, if possible, or install new pegs that turn smoothly. 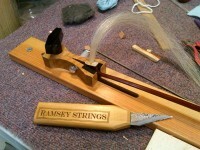 We also install Wittner Fine Tune pegs for violin, viola, and cello. Because they offer effortless and precise tuning, many teachers have recommended these for their students! We can restore the beauty of an old spirit finish, spruce up the polish on your contemporary instrument, or make that unsightly nick in the edge disappear. New pegs and tailpiece can dress up your instrument. Because no two players are alike we custom fit chinrest and shoulder rests for comfort. We love to restore old family heirlooms for the next generation’s player, or for wall display purposes. We find that many cellos and basses have endpin trouble. Some examples are poorly fit or loose, or badly aligned endpins, resulting in decreased tone and stability. We can correct all issues or install a new endpin if necessary. We also install Stahlhammer endpins for cellists. Something new? How about improved tone? The Klaus Bender endpin is not just push fitted into the instrument, but screwed into the bottom block of the instrument. The fine thread on the cone nearly doubles the area of contact compared to conventional smooth cones. Screwed in tightly, this allows perfect sound transfer between tailpiece, instrument and end pin. The improvement of the sound is unmistakable! These are available for violin, viola, and cello.